The pathways…the purposes of God are a message of simple clarity in our Bible readings this day. It is a message that we as a parish and community and world have perhaps been struggling with these past months as economic challenges and personal losses have been shared by so many. Yet, as always, when we allow God to speak to our hearts through Scripture, prayer, sacrament and life we can each know the reassurance and hope that we are summoned by God to be sent through life in the simplicity of His grace. Summoned by God ~ The prophet Amos sets the stage for us today. In the land of Judah about 800 years before Christ a shepherd and keeper of Sycamore trees ( a type of fig, known as the Sycamore fig, food of the poorer people) was summoned by God to challenge and confront the materialism and injustice that had filled the hearts of the people. Poor, unlearned and of no significance in the society of his day Amos was called beyond self to proclaim the simplicity of repentance and grace in the eternal wealth of God’s Kingdom. St. Paul would affirm the same timeless message as the Holy Spirit sought to bring the believers of that day and now to realize and see our eternal riches and destiny IN CHRIST JESUS. Our Lord summoned the first Apostles as a leaders and example of individuals, called with the wealth and reality of there humanity to follow Christ in service together for His Kingdom. All these example affirm that God destines us from our mother’s womb to His purposes. This life is not our own…but God’s. As we allow and rest in that truth we can experience the riches of God’s provisions in the circumstances, blessings and sorrows we face to be equipped for the path of His choosing. There is no lack of the summons of God for people to know,,,follow…serve the Kingdom of Christ. There is no shortage of these summons or vocations. The lack, the shortage is in our listening and responding that summons. Yet it is in yielding to our Lord’s summons we experience the fulfillment of our destiny as we permit our humble self to be sent by God. Sent by God ~As we realize the summons of Christ we soon learn, with the prophets and apostles that we are sent. We also realize that our summons and our destiny will likely by far more simple and humble yet it is essential to remember to whom we are summoned and with whom we are sent. Amos the prophet, the apostles and each of us share in some small way the holy joy and privilege of proclaiming in deed and word the redemptive love, justice and mercy of God. We are sent to help each other learn that it is not in our accomplishment or possessions that we find our worth but it is in living in humble love that we proclaim the mercy and justice of which the Psalmist sings. As we share these pathways of life we are sent to help with each others burdens, to be a people of healing deeds and words of genuine hope and mercy in the power of Christ. We are summoned and sent to share the infinite riches of the simplicity of God’s grace. Simplicity of Grace ~ The prophets, the apostles shared a common qualification. The were basically simple people of rather humble means who heard and responded to God. They gave there basic intelligence and faith and sought to be the most FAITH-FILLED followers as possible. 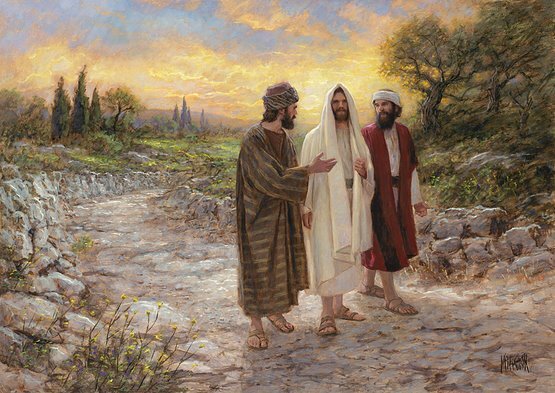 Often they had no great wealth, stature or education except and willingness to learn and discover, top proclaim and share, in the simplicity of the daily grace God provided, the wealth of God’s eternal Kingdom and mercy. Christ in sending out the apostles sent them with barest of necessities and preparation. He sent them with the wealth of a need to trust the provisions and power of their Heavenly Father. And so sent them empowered and provided for to live the Kingdom. Times have changed. Our world is so much more intensely materialistic and self-centered. Yet God’s eternal Kingdom truth and love have not changed. The God of Amos, Paul and the other Apostles who knew well their lives and world, who knows as well, our life, our world calls us each to follow and share His summons to be sent on the pathway of God’s choosing to proclaim His Kingdom in the rich simplicity of His grace.